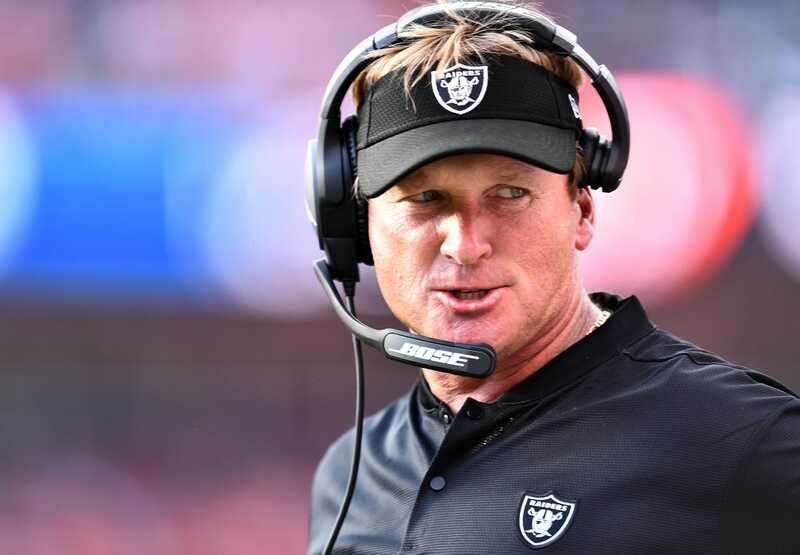 Oakland Raiders head coach Jon Gruden told reporters Monday he doesn't have second thoughts about trading defensive end Khalil Mack despite the team's lack of pass rush through two games. "No, it doesn't make me regret the trade," Gruden said. "We made the trade. We made the trade. ... We would have loved to have him here -- and I'm not going to keep rehashing this -- I would have loved to coached him, loved to have him here. But he's not here. "Somebody's got to step up. We got to keep building our football team, and that's what we are going to do. Hopefully, we see more from Arden Key. Hopefully, we see more from PJ Hall when he gets healthy. Hopefully, we prove that in the long term we did the right thing." After a lengthy holdout as Mack sought a new contract, he was dealt to the Chicago Bears before the season in a trade that included two first-round picks in return. He had a strip-sack, fumble recovery and pick-six in his Bears debut in Week 1, then added another strip-sack Monday in Chicago's 24-17 win over the Seattle Seahawks. Key, a rookie third-round pick who took Mack's place in the starting lineup, has three quarterback hits but has yet to get a sack. Hall, a second-round rookie defensive tackle, hasn't reached the quarterback yet, and he missed Sunday's game in Denver with a foot injury. Gruden said Hall is unlikely to return in Week 3. Gruden also said the Raiders "need to get to get more out of" defensive end Bruce Irvin, who had a sack in the opener and one QB hit in each game. "He's had some really good snaps," Gruden said of Irvin. "We need more and more from him. I know he's giving us everything he has and it's tough on him, certainly, because we do have a lot of new guys around him up front." Defensive tackle Maurice Hurst, a fifth-round rookie, had the team's lone sack against the Broncos.